As a part of promoting other user to write about Tally, contributions were invited from people who have some or great expertise in Tally. ApniTally reader Rajiv has grabbed the first spot to publish his contribution. He provided ApniTally readers with a free Recycle Bin Utility for Tally. This utility works same way as the normal Recycle Bin in windows run. Entries deleted in tally can be recovered from Recycle Bin. Go to Recycle Bin and find out all deleted entries. Follow the instructions if you want to retrieve back or permanently delete them. After Installing it gives extra menu Item of Recycle Bin in Gateway of Tally. While working in Tally delete what ever vouchers you want to delete by pressing Alt+D. If you delete some thing accidentally then no need to panic. Just go to Gateway of Tally and Press R for Recycle Bin. Here you have to options. either to delete permanently or to restore the entry. If you press Alt+D again then the entry would be deleted but if you press enter then that entry would be restored back. Extract the contents and you would find two tcp files. Copy the file according to your Tally version. e.g. if you are using Tally 7.2 then Rin.tcp otherwise Rbin9v.tcp for Tally 9 in your tally folder. If any tally expert want to show his work on Tally then ApniTally would be pleased to review and present to its readers irrespective of work being free utility or a paid one. Related readings : Contributions Invited. In which format I export data from my software so that Tally 6.3 take Import without any problem? This activity is on daily basis. AFTER LOADING THE FILE , AND WHEN OPENING THE TALLY ,, IT DISPLAYS THE MASSAGE "
"d:\Tally9\Rbin9v.tcp"(1): error T0028: Unable to load file 'd:\Tally9\Rbin9v.tcp' invalid file format! if we permanently wanted to delete data or company from our tally software, so that no one can recover it even the experts. 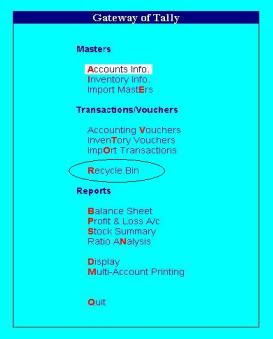 use administrator tool comes with the tally erp 9 to convert this tdl for the tally erp 9 as this is for the tally 9 only. This is really very useful. my score is 10/10 for this TDL. But one thing I want to do with this TDL, for that my query is "I Have 10 user and 1 admin in my Tally Company & I want to restrict all the users to access the Recycle Bin and only the admin will be allowed to access the Recycle Bin". With the help of this feature we can prevent the intentionally deletion of Entries in tally and can caught the culprit. I hope you you will reply my comment, I am waiting for your kind reply. I have used recycle bin, its very useful I must say. but one thing I want to do with this TDS and that is "I want to block other user to access recycle, I only want to admin to access the recycle bin" if this will be possible then it will be more effective tool to caught the culprit who is deleting entries intentionally.